1 Toss pear, apple, onion and 2 tablespoons Hellmann's® or Best Foods® Real Mayonnaise in 12-inch nonstick skillet and cook over medium-high heat, stirring frequently, 12 minutes or until tender and lightly golden. 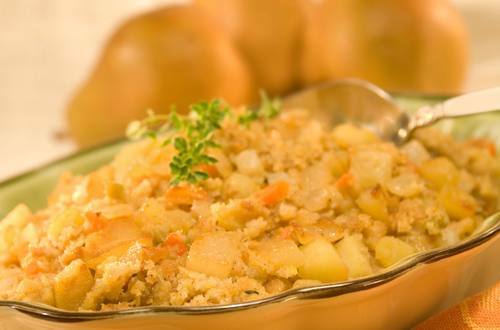 2 Meanwhile, combine remaining 6 tablespoons Mayonnaise, stuffing mix and hot broth in large bowl. 3 Stir fruit mixture into stuffing. Arrange stuffing mixture in serving dish, then sprinkle with walnuts.